The well-travelled She Excites won’t have far to go at The Entertainment Grounds at Gosford this Thursday, as local trainer Luke Hilton saddles her up on her home track for the first time. Starting her career at Warwick Farm with Jason Coyle, the five-year-old Excites mare also spent some time with Chris Heywood at Wagga Wagga before settling in with Hilton at his Gosford operation. She Excites breaks her maiden at Mudgee. Credit: Janian McMillan - Sarsfield Thoroughbreds. She saluted at Mudgee at 50-1 in her first start for the Hilton camp, and has been thereabouts ever since. She steps up to 2600m and the engagement of dual Melbourne Cup winning hoop Corey Brown is a plus over this staying trip. The competition won’t be easy though, with the Hayes, Hayes and Dabernig and Waterhouse and Bott stables both well represented. Another interesting watch on the day appears to be the Paul Perry trained Eagleworks in the Rapid Scaffolding BM 65 Handicap over 1200m. Aside from failing at his first ever race start, the three-year-old Fastnet Rock gelding has not finished further back than fifth in his last 12 outings. A fantastic money-spinner for connections, jockey Jason Collett will be looking to add to these earnings on Thursday. 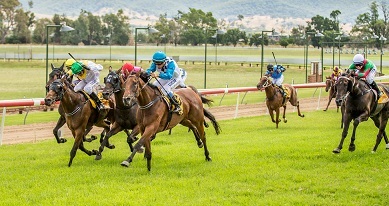 The eight-race card wraps up with the Better Business Advice Provincial Class 4 Handicap over 1900m, which shapes up to be the most competitive event on the day. The Gary Portelli trained Strome is aiming up for a hat trick, Kevacca’s Girl has drawn nicely in gate one, while the ultra-consistent Bjorn Baker mare Lifeline Princess comes in nicely with some weight relief from apprentice Jean Van Overmeire. Gates open at 11am, with the first race scheduled to jump at 11.55am. Panorama Lounge and Open Terrace hospitality packages are still available, and free general admission entry is on offer. View the fields, form and race replays for Thursday's Gosford meeting here.